It’ll be the second powerful instrument to be launched, following a few years behind the James Webb Space Telescope, set to launch in 2021 designed to be sensitive enough to look back to the beginnings of the first galaxies. NASA hopes to complete construction within a few years and launch by the end of the 2020s. The project will create 160 jobs in Rochester. Harris’ operations have gone interstellar. Just last week, they celebrated the completion of their largest project ever that will be incorporated into the National Science Foundation’s telescope in Chile that will take images of the southern night sky every few days for more than ten years, helping scientists detect potentially hazardous asteroids and new solar systems. 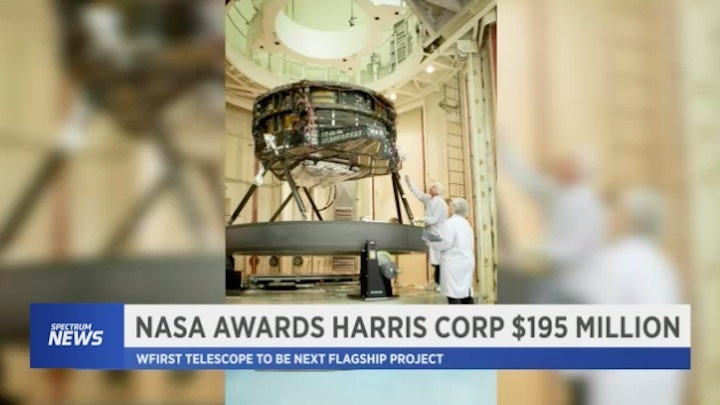 Rochester, N.Y. - Harris Corp. has been awarded nearly $200 million from NASA to help build the agency's next major space telescope. Senator Chuck Schumer's office announced Wednesday that the $195.9 million is for the contract for the WFIRST Telescope. WFIRST stands for Wide Field Infrared Survey Telescope. According to Schumer, the telescope "will explore an area of space 100 times bigger than the Hubble Telescope, and thus significantly enhance the precision and clarity of NASA’s view into outer space. The contract covers the "period of performance" from Nov. 30, 2018 through Dec. 1, 2025. NASA's mission is expected to support 160 jobs in Rochester. 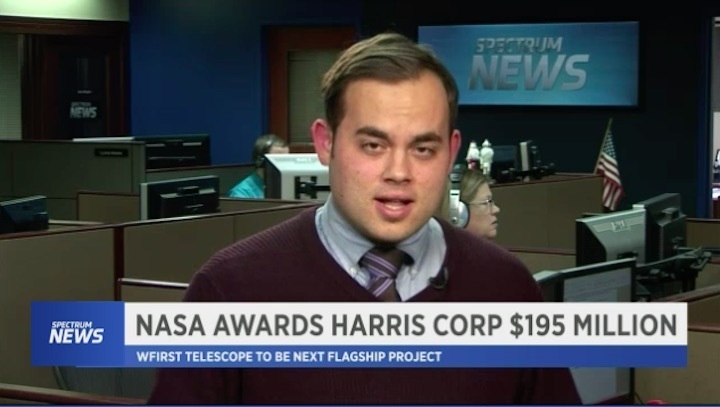 Harris will be in charge of the Optical Telescope Assembly for the WFIRST mission, which includes the providing the personnel, services, materials and equipment to build and modify the telescope. The work will be performed at the Harris' facility in Henrietta and at NASA’s Goddard Space Flight Center in Greenbelt, Maryland. According to NASA, the WFIRST mission's initial goals include "studying the newly-discovered phenomenon of dark energy, measuring the history of cosmic acceleration, completing the exoplanet census begun by NASA's Kepler Space Telescope and demonstrating technology for direct imaging and characterization of exoplanets." Artist's rendering of WFIRST observatory. Wide Field Infrared Survey Telescope (WFIRST) – a mission concept to answer vital questions in both exoplanet detection and dark energy research. The powerful role that spaceborne telescopes can play in the future was underscored by a seminal study in 2010 called New Worlds, New Horizons in Astronomy and Astrophysics, written by the U.S. National Research Council. That study, which laid out a blueprint for ground- and space-based astronomy and astrophysics for the decade of the 2010s, rated WFIRST as the top-priority large-scale mission. In May 2018 WFIRST passed a key project milestone, clearing it to enter its preliminary design phase (Phase B) and begin major procurements for flight hardware. The mission completed a series of critical reviews indicating the project is on track to enter the next development phase and meet its scientific goals within its budget. NASA's current plans call for WFIRST to perform an extraordinarily broad set of scientific investigations: studying the newly-discovered phenomenon of dark energy, measuring the history of cosmic acceleration, completing the exoplanet census begun by NASA's Kepler Space Telescope and demonstrating technology for direct imaging and characterization of exoplanets. The WFIRST will image large regions of the sky in near-infrared light to answer fundamental questions about the structure and evolution of the universe and greatly expand our knowledge of planetary systems around other stars.